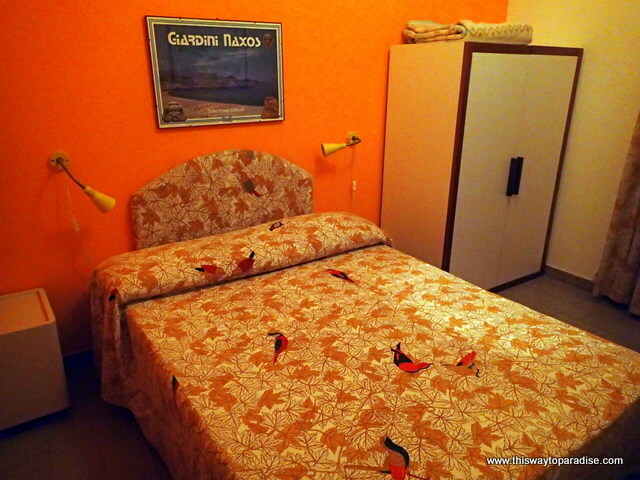 Gianni House Hostel is located in Giardini-Naxos, Sicily. Giardini-Naxos is the seaside resort just under the more famous Taormina. First of all, Gianni has the best directions of any hostel I’ve seen as how to reach his hostel. He even includes a video with arrival directions on his website. I will never forget the great welcome that I had from Gianni. He was waiting for me at the bus stop when I arrived. 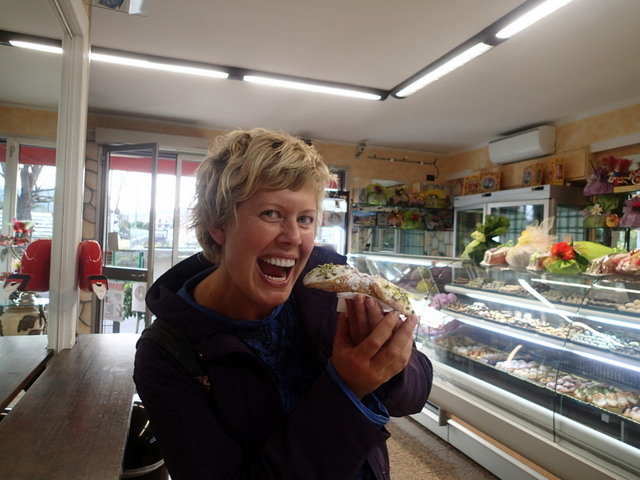 He immediately whisked me into the best bakery in town, in front of his hostel, to have them prepare a fresh cannoli for me. Then, he led me up to the roof of the Gianni House to see Mt. Etna in all of her glory. Going to the rooftop was the first thing I did everyday to see the changing faces of this majestic volcano. Gianni gave me great suggestions of where to eat and what to see while I was there. You should know that while you can walk to Taormina, it will take over an hour. You are better off taking the bus (the bus stop is just in front of the hostel). The bus comes hourly, and the last one returns from Taormina at 10:15 pm. 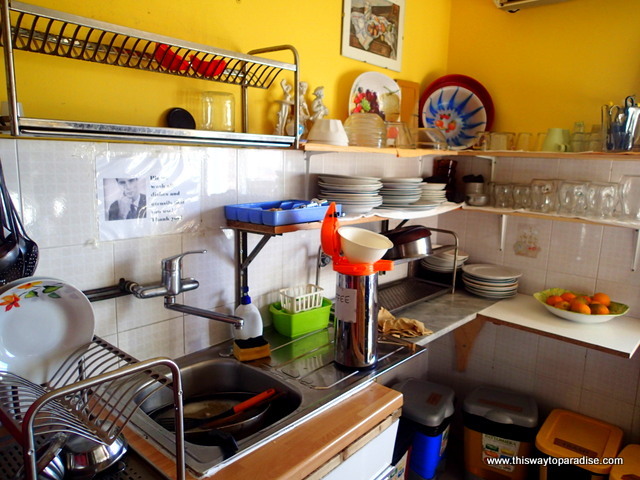 The kitchen is nice and bright and there are a couple of refrigerators where guests can store food to prepare meals. The common area is nice and they make great coffee for breakfast. Gianni is currently building a bigger common area and kitchen. My bed wasn’t the most comfortable bed I’ve ever slept in, but it was adequate. 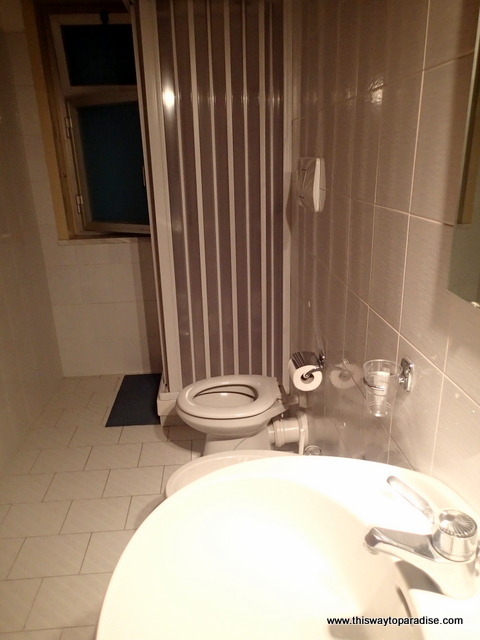 The shower in the bathroom was also pretty small, but for the price of the rooms, it is a great choice for single travelers to stay and get their own private room. The staff at Gianni House in Giardini-Naxos was friendly and helpful. There was always someone at the desk to help me figure out what the bus route was or to help me with my planning for the day. Gianni especially was a great host, and he really made the place something special. Disclosure: I received a free stay at Gianni House, but all opinions in this review are my own. I also highly recommend Gianni House! Everything you said about Gianni House is right on with one exception. My wife and I had a very comfortable bed. We had no complaints whatsoever about the accommodations. Friendly and accommodating staff made for a wonderful stay. Emilio met us at the train station when we arrived and also took us to the bus station when we left. 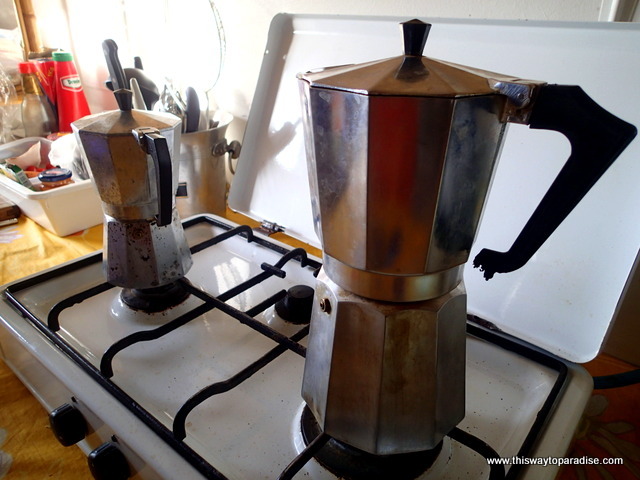 For the budget traveler Gianni House is the place to stay in the Taormina area. 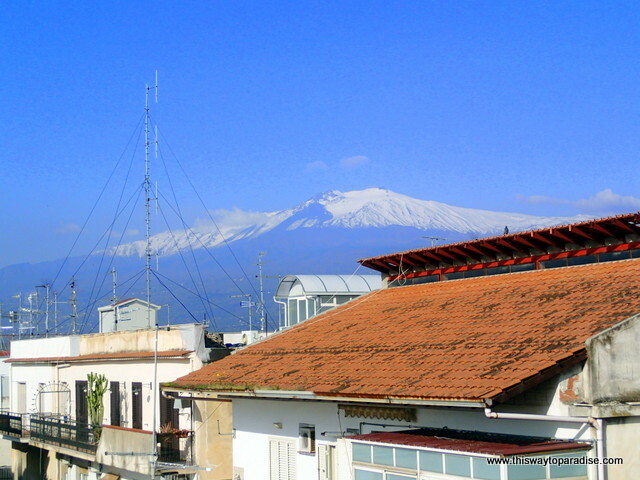 It’s convenient to Catania, Etna, and other cities in eastern Sicily. Every evening we walked into Giardini Naxos for dinner. The beach, grocery store, and main intercity bus station are all just a short walk away. The bakery near Gianni House may be the best in all of Italy. I also suggest you have dinner at Bar Nazionale on Via Vittorio Emanuele in Giardini Naxos. It’s run by the most delightful couple you will ever meet!